But I was bored and wanted something to draw with. So I dripped water all over the floor and reached for the bathtub crayons I keep under the sink for the nieces and nephews. Let’s just say Matt had a surprise note waiting for him on the shower wall the next time he got in to wash up. What’s more fun than drawing on things you normally aren’t supposed to draw on? This MUST be what the inventor of bathtub crayons was thinking when this bath time art supply was invented. 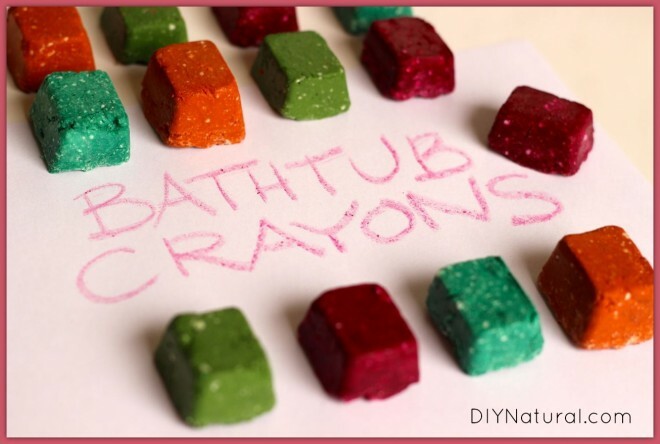 This tutorial will show you how to make your own natural bathtub crayons so family members can enjoy a little drawing time in the tub. Your kids will love helping with this project, and you’ll love the money you saved by making your own! Who knows, you may even discover the next Picasso right in your own bathroom. 2. Spoon equal amounts of the mixture into several small bowls (depending on how many colors of crayons you want to make). 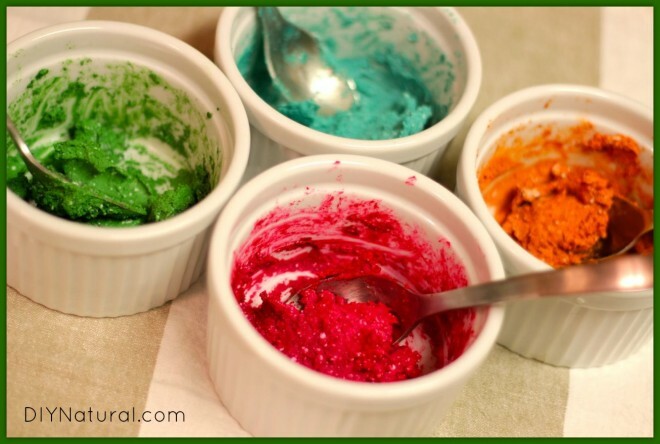 Sprinkle your powdered colorants into the separate bowls, stirring after each addition, until desired color is reached. You will end up with a very thick paste. 3. 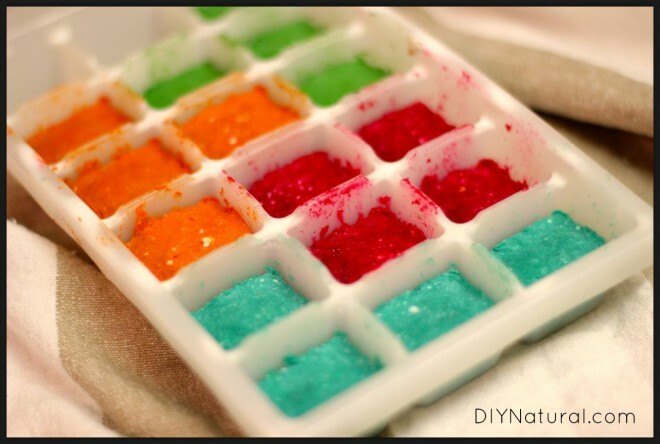 Tightly pack the colored soap into your molds, washing hands before working with each new color. Set aside in a warm, dry place to harden. 4. Allow to dry for 5-7 days. Once crayons are dry, gently remove from molds and allow to dry for 2-3 additional days before using. **The above recipe makes about 15-20 small crayons. Double or triple ingredients for a larger batch of crayons. Choosing your soap – Choose any type of soap you are comfortable using. You can use a homemade bar of soap, or use a plain white store-bought bar. White bars provide a perfect pallet for making brightly colored crayons. Choosing your dye – I have used natural dyes from vegetable colorants (like these), but the crayons lose their vivid color once dry, resulting in a batch of earth-tone crayons. These still work wonderfully in the tub, and you can relax knowing that your kids won’t be bathing with artificial dyes floating in their bath water. 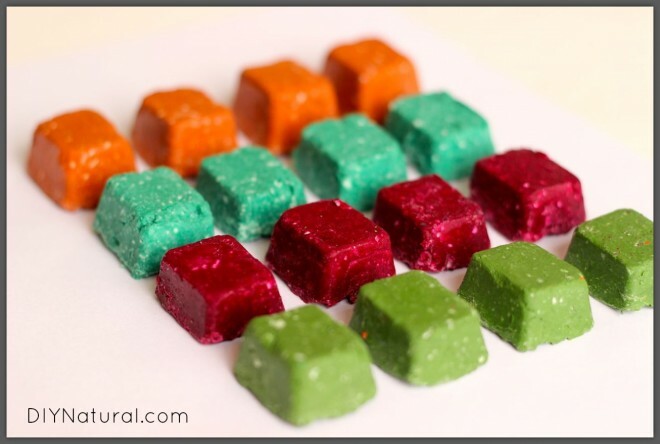 I have also made these with liquid synthetic food dyes, which produces very brilliant colors. But I always worried about kids soaking up the artificial colors through their skin. I finally found these natural powdered colors that are typically used to color mineral makeups and soaps. 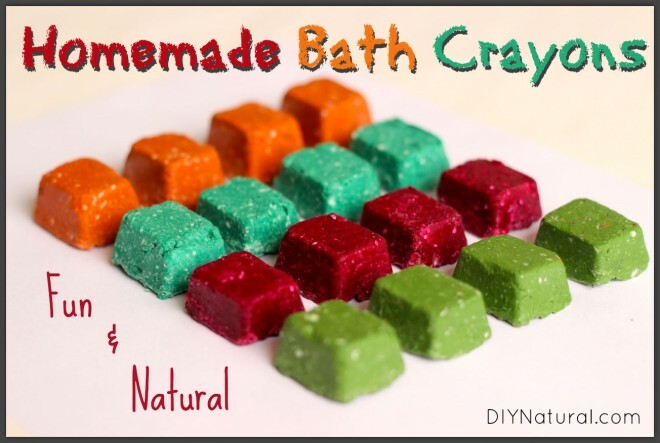 They are derived from things like minerals and plants, and create a very vivid bathtub crayon without the concerns of synthetic dyes. The choice is yours — use the colorant you’re most comfortable with. Packing into molds – Larger crayons will take longer to dry. I use a miniature ice cube tray and only fill each slot about 2/3 full. Packing the soap tightly into molds is the most important part of this project. If soap is not tightly packed, crayons will come out of molds cracked and crumbly. Your kids will cry because they waited more than a week for their finished crayons. So pack. Pack tightly. These crayons are so cute when finished. They would make delightful little party favors or colorful additions to an art-themed birthday gift for young children. They can be used as stocking stuffers (there’s still time! ), added to an Easter basket, or handed out as an alternative to candy on Halloween (labeled so kids don’t try to eat them, of course). Or…maybe you’ll just use them to entice your dirty children into the bathtub. Your children will enjoy using these to create masterpieces on the bathtub wall while they’re cleaning up! Do you know someone who would enjoy these? Will you jump in and try this project? My daughter has an oral fixation and eats almost everything. If she ate some would she get sick if I used a natural soap? I don’t know if your daughter would get sick from eating these. I would recommend very close supervision just in case. You may want to try using powdered herbs like tumeric, ground parsley, and beet root powder to color them (like Kate did in an above comment) instead of the mineral colors. And definitely use a natural bar of soap. Hey Jessica. Sounds like your daughter and my daughter are quite a lot alike! LOL If you’re using a natural, vegetable oil-based soap, she won’t necessarily get “sick” if she puts it in her mouth. Because nearly all soap contains lye, should she actually EAT the crayons, the outcome may be a different story. Most soaps don’t taste good anyway, so even if she goes in for a lick, the taste should be awful enough to keep her away in the future. Does any of this stain the tub or grout? Even if you choose to use synthetic food coloring? 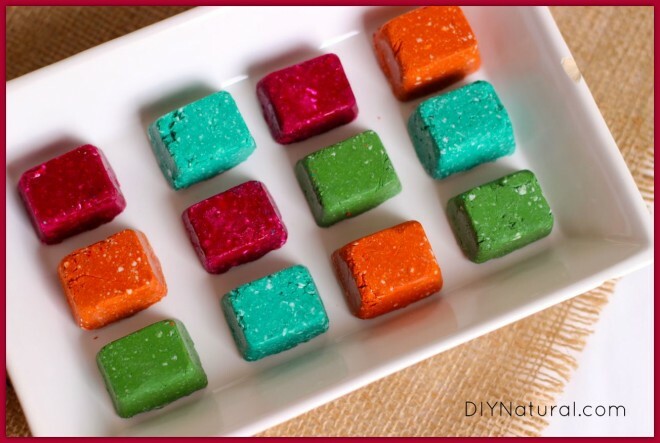 No, it will not stain the tub or grout even if using synthetic food coloring. My niece and nephew used a batch of synthetically colored ones and got them ALL over. We had no problem cleaning them up! Thank you for this recipe! Just finished a double batch with my daughter as party favors for her fourth birthday, using turmeric, powdered beet root, and ground parsley. We’re excited for them to dry. Awesome! Be sure to return and let me know if they hold their color after drying! I was thinking about using ground herbs I had in the cupboard, but instead I got the mineral colors. I just love this idea! This is perfect for my niece who always comes to stay. Oh and I will be secretly using them too! HeHe! Can you give approximate amount of colorant per recipe above please? Not sure how much to order. Have you tested this on fiber glass tubs as far as staining? We have a hard plastic tub (not sure of the exact material it’s made of) and these crayons do not stain. Because they’re made from soap they will not even stain white washcloths or bath towels.